By all measures, Janet Froetscher is a success. As president and CEO of the United Way of Metropolitan Chicago, she has led a massive consolidation to streamline the 75-year-old organization, making it more effective by ensuring that more resources reach communities that most need them. In 2004, UWMC distributed nearly $55 million to the various agencies — numbering about 400 — with which it partners. The 1983 Kellogg School alum has also been twice named by Crain's Chicago Business as one of "Chicago's Most Influential Women," and once as Crain's "40 Under 40" leaders. 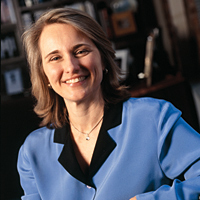 She has served as COO of the Aspen Institute, a global forum for leveraging leadership to improve society. In addition, during almost a decade as executive director of the Commercial Club of Chicago's civic committee, she worked with the city and its top CEOs to implement strategic, operational and financial improvements in such organizations as the Chicago Board of Education. But these successes wouldn't much matter to Froetscher had they not made a real community impact. "Over my career I've moved from focusing on conventional 'success' to focus on 'significance,'" she says. "When you achieve success, you start wondering how those achievements matter in the bigger landscape. We are here to make the world a better place and leave a legacy. I never placed financial goals ahead of my desire to make a difference." Kellogg School Professor of Public Management Donald Haider says Froetscher's actions confirm these claims. "If you look at Janet's career, you see that she is attracted to exciting and challenging arenas where she has great impact that spans public, private and nonprofit sectors," he says. Haider, who is also director of the Kellogg nonprofit management program, states that Froetscher has been generous with her time, teaching in the school's degree and non-degree programs and participating in events sponsored by the Center for Nonprofit Management. She and her husband, Robert '83, managing director at Willis Stein & Partners and Kellogg Alumni Advisory Board member, also have made financial contributions to the Kellogg Annual Fund. "I have learned over the years that the Kellogg connection is an ongoing and valuable relationship. My wife, Margee, and I have especially enjoyed attending inspirational Kellogg conferences and alumni board meetings. We are also proud of the extensive use Kellogg students make of the quiet study room that bears our names at the Donald P. Jacobs Center." Scott H. Filstrup '67, president of The Consultants Ltd., Tulsa, Okla.
"Janet's a role model, a leader and exemplifies the best of Kellogg," says Haider. Her leadership has indeed made a difference at United Way, where she and her team were faced with the daunting task of consolidating 54 local chapters into one. They partnered with McKinsey and The Boston Consulting Group to research best practices and ultimately shaved 25 percent of their costs, saving $3 million — money that now is earmarked for community projects. "It's never easy to make these cuts because our staff is very important to us and contributes to our success, but there's no question that the right decision is to invest this money back into the communities we serve," says Froetscher, 45, who joined United Way in early 2003. Making tough decisions is part of the leader's job, she says. "The leader sets the vision, what the future looks like and the role your organization can play. You then have to get people excited and mobilized to achieve the goals," explains Froetscher, who credits a religious upbringing for her drive to give back. Even when the goals are formidable, as they were when Froetscher needed to consolidate chapters, merge their boards, and rebuild various processes (all within six months), the leader must "never ask if you can get there, but how you get there," she says. "Everybody wants to be part of something meaningful, and it's the leader's job to paint that picture for the team and help others see their role in making it happen," says the Kellogg graduate. To lead her team, Froetscher relies on her communication skills, necessary for collaborating with United Way's many local partners. "You can't get there yourself," she admits. "You need to hire the most capable people and let them do what they can do. No matter how smart you think you may be, you're not going to know everything — finance, marketing, communications." With the consolidation behind them, UWMC should be even better positioned to deliver its host of critical health and human services. But traditional struggles remain. "The toughest part of my job is that we receive three times as many funding requests than we can fill," says the CEO. "We have to say 'no' to some really good programs, and that's very hard, because you know some people in need get turned away." Froetscher's commitment, however, seems unflappable despite the hurdles: "I never feel as good as when focused on other people. That's where I find my happiness."